San Francisco looks at the rustic folk concept a little bit different from the rest of the States' Americana troubadours. 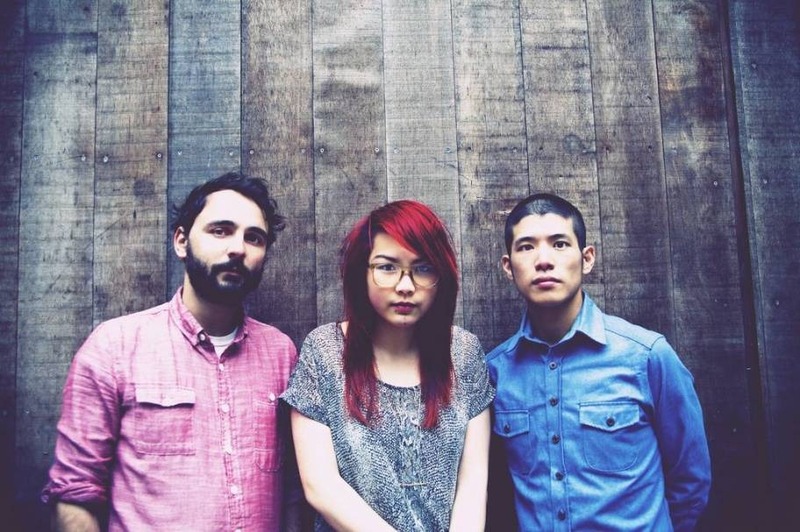 Meet the Bay Area trio There's Talk, combining the earnest and intimate dialogues of song and strings fronted by Olivia Lee with Kellen Balla, and Young Lee. Premiering a stream of their Tiny Strands EP, Olivia leads the piano paved path on the opening number, “The Salt”. Seaside feelings wash up with salt water scrapes and the cleaning of abrasions where comfort and safety from lonesome shore vulnerabilities are the song's most cradled desire. “You were my fortress of stone, shaking you to the core”. “Lint & Feather” strums a sparse and acoustic space between instruments of voice and hair tussled picked banjo and guitar strings. The gentle and unplugged quality gives a moment's pause, where the slight application of electronic touches are absent to enjoy Olivia's gentle singer-songwriter spaces, like the effects of quality and conversation in the early calm of the afternoon. While “The Salt” might get the bulk of buzz from this extended player, the discovery and transformation that takes place on “Hummingbird Place” will have you re-listening again and again to find those treasured moments and places where, “everything changes”. The effectiveness of “Hummingbird” is the way the shifts are barely noticeable until the rhythm machines and key tones slowly bring the song's natural cycle to the sound of a new day and found sacred space. The curtain call brings orchestrated restraint “Slip Light Gold” works in these sweeping paces of foothill like song arrangement sewn together with Olivia's objectivist poetic economy mechanics with sequenced word drops of, “soft, still, sun”. And then as if on cue, the vocals soar across the production's low laying peaks and orr strewn valleys for the mountainous moriah of Marin's Mount Tamalpais majesty that overlooks the foggy entrance of the Golden Gate. In closing, the title track's finale brings everything back to the acoustic minimalism of “Lint & Feather”, where the only electric device present is the recorder, sound board, and perhaps a loop pedal or 2. “Tiny Strands” brings out the accumulated loose particulars of mannerisms, memories, minutiae, and reminders of family, loved ones of the former, present and future that are cherished, doted upon, recognized and observed daily. Olivia Lee took the time to discuss and outline the little monumental instances that comprise the Tiny Strands EP. Tell us about constructing the Tiny Strands EP. I had two close friends (one now runs the label we're releasing on) that were very persistent that I record a solo album. I had some ideas I had tested out in past bands but never sat down to record the way I envisioned them. My friend Nic De La Riva invited me to his garage studio where he allowed me the time and helped me record the majority of the album. He was really open to letting me go on experimental tangents and gather percussive sounds; we went to a zen garden once to sample river sounds. I recorded the synths at home and programmed the beats at coffee shops. Before Kellen, and later Young, joined the band we had sampled some old hardware drum machines together which I used to make most of the beats, although I'm pretty sure he had no idea what I was doing with them at the time since I was pretty shy about it. I recorded the vocal and guitar overdubs at Tiny Telephone with Ian Pellicci, who also mixed the record. Bridging organic folk with electrified atmospheres can be a challenge, how do you approach the holistic and amplified elements in your music? I try to recreate the feeling the subject matter brings to mind more-so than following linear song structure or instrumentation. I enjoy patching the disjointedness together. What's the secret to create new folk-forms that are not the same static folk we grew up with? I suppose disregarding the limitations of traditional folk structure would be a good place to start. Do exactly what you want unapologetically. Where did inspiration for the acoustic title track come from? I think often about the fragility of little monumental instances, where they lead you and how easily they could've not happened. It encapsulates something that might not have happened, but did, and left me forever changed. What are some San Francisco acts you are excited about these days? There are a hell of a lot. Astronauts, etc. and Social Studies are on heavy rotation. Waterstrider is also making some very solid original music. Lauren O'Connell has been a longtime favorite of mine, doing simply honest folk. Owl Paws is the SF local, Local Natives. I could really go on. I'm rooting for the wildfire to catch for them and many others. There's Talk's Tiny Strands EP will be available August 6 via Bandcamp.